In vitro culture of neural crest cells allows for the manipulation and study of neural crest cell function in a cell-autonomous manner. 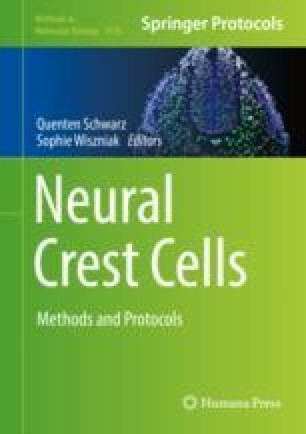 While several stable neural crest cell lines exist, the transformed nature of these cells may not closely reflect the in vivo properties of neural crest cells, hence making molecular and functional analyses using these cell lines difficult to interpret. Here we describe a robust method to culture primary mouse neural crest cells ex vivo for several days to weeks in culture. We further describe a method for siRNA knockdown in these cells to study gene function. This culture method can also be adapted for other molecular analyses, including addition of small-molecule inhibitors and/or growth factors to the culture media, as well as culturing neural crest cells from knockout or genetically modified mice.